Fourth time’s a charm for movie star Sean Castleberry. He took everyone by surprise when he announced that he’s engaged to his girlfriend of one month, a woman who once tried to have him arrested. Castleberry will be marrying Belle Colton, his next door neighbor and a retired art teacher, later this week in a private ceremony. His rep says that the two are still deciding if they want to live in Seattle or settle in L.A.
And that’s how I imagine the entertainment news show would report the happenings in Stop the Wedding, a fun Hallmark offering with a twist on their usual love story. Instead of one straightforward romance, we’re treated to two whirlwind adventures. The first involves Sean (Alan Thicke), an actor on the wane, who falls in love with Belle (Lini Evans) after she calls the police over noise complaints. 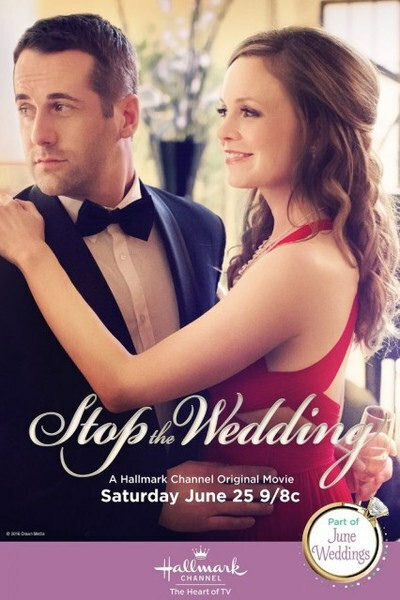 They announce their engagement to their families one month later, but the news shocks Sean’s son, Clay (Niall Matter), and Belle’s niece, Anna (Rachel Boston). The latter pair aren’t convinced it’s real love and, after the requisite misunderstanding, join forces to stop the wedding. The movie isn’t as zany as it could be in feature film form. Clay and Belle only manage two attempts at sabotage before the engaged couple smarten up and flee to Vegas, leaving behind the meddlesome kids. The younger Castleberry and Colton try to take advantage of their elders’ opposing interests and personalities, but true love is true love, whether it takes one year or one month. After Clay and Belle realize this, they make a mad dash to stop the elopement in favor of a grander affair. The movie’s running on a television budget though, so we’re only treated to a fraction of the Vegas thrills. If you want scenic chases down the Strip or through the Bellagio lobby, you’ll have to look elsewhere. Luckily, Boston and Matter make up for the missing spark. Their characters are like a clever doubles team, quick and supportive even if they aren’t skilled at breaking up marriages. Divorce lawyer Anna Colton is a copy of her spirited aunt while orthopedic surgeon Clay is the opposite of his dramatic father. Both characters are committed to their work and have no interest in dating at the moment, so naturally they fall for each other in a matter of days because shame on them for lecturing their parental figures on love. I like that Anna and Clay’s feelings for one another are not at the fore. Sure, we know they’re right for each other the moment he spills coffee all over her favorite shirt, but in focusing on their scheming, we also get to see how compatible they are in every day, and not so every day, situations. They’re simpatico when it comes to problem solving, determined to make their point but also willing to concede to a better idea. That they also have their own romantic storyline is a bonus. Posted in USA, Western TV reviews and tagged Hallmark Channel, romance, TV movie on October 27, 2018 by limmer13. 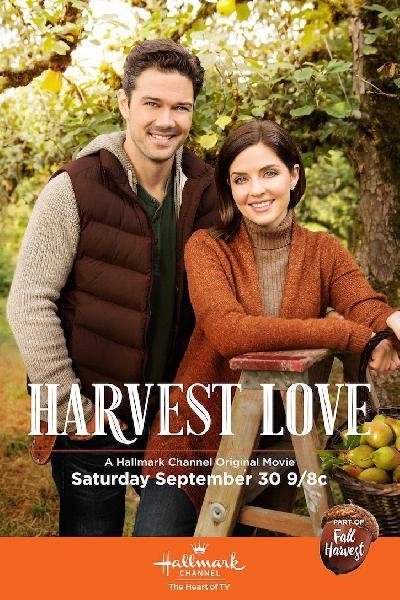 I like a hot pear farmer as much as the next person, but pretty people picking fruit does not a movie make, even if those people do look like stars Jen Lilley and Ryan Paevey. Harvest Love is a handsome film, in the Hallmark sense and not in the David Lean sense, but it lacks a plot to match. There are two brief moments of narrative tension bookending the film, and unless you really want to gaze into Paevey’s eyes, which are something to behold, you’d do better to find a movie with an actual story. Things start off in a promising way. By that I mean the two main characters have a sparky, clichéd run-in. Seattle-based surgeon Luna Gilson (Lilley) is headed out to her family pear farm for a week with her son, Andy (Brenden Sunderland), as a way of making up for her lack of attentiveness recently. She could also use some time off since she’s still mourning her husband’s death. It’s en route to the Gilson orchard that she discovers what all Hallmark viewers know, that country roads are great places to meet romantic partners. A blocked path leads to a confrontation with Will Nash (Paevey), who happens to manage the farm after his family lost their own. The misunderstanding is quickly resolved…and then nothing happens for the next hour. Well, that’s not strictly true. Andy befriends a local boy, the townspeople get ready for the harvest festival, and a farmer breaks his leg. Also, the elder Gilsons, who are on a medical service mission in Cameroon, decide to sell the farm, a move Luna doesn’t favor but one that she agrees is the most sensible. Unless you’re eager to find out who’s going to win the pumpkin carving contest, there’s not much to keep you hooked. Like Luna’s respite, this movie is a leisurely break filled with small moments that nudge the potential lovers together and that gradually convince Luna that a life in tiny Pineview might be better than the one she has in Seattle. I don’t blame the actors for the dull proceedings. The script doesn’t give them much to do except to bond over unripe pears and a harvest moon. Sure, it doesn’t help that Lilley and Paevey are also distractingly beautiful and speak sweetly to one another with hushed voices. The more I watch them, the more I feel like the third wheel and that I should just leave Luna and Will alone in this tiny northwestern town while I get on with my own messy life. They have no trouble falling in love with each other. Will explores the orchard with Andy and shows that he can be a good father figure as well as a good partner, and Luna finds an intellectual match in the agriculture scientist who’s trying to grow his own variety of pear. For once, I wouldn’t mind more focus on the schmuck at the competing farm who is happy to see the Gilson’s decline. Posted in USA, Western TV reviews and tagged Hallmark Channel, romance, TV movie on October 25, 2018 by limmer13. 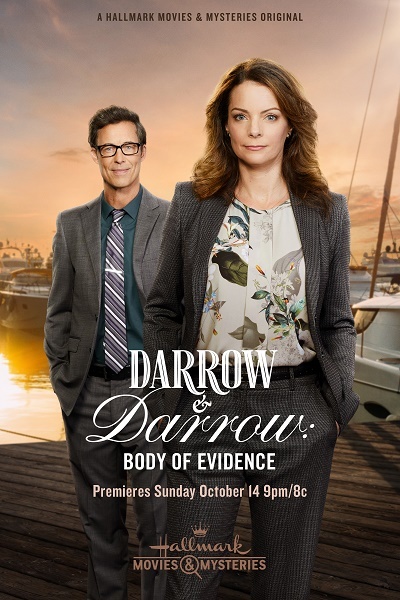 If I were in charge at Hallmark, I would hire someone to write better titles and to make sure there were at least as many episodes of Darrow & Darrow as there are Garage Sale Mysteries. The new series gets stronger with each outing, and Kimberly Williams-Paisley, Tom Cavanaugh, and Wendie Malick are that rare trio who light up every scene with wit and intelligence. They are unnecessarily committed to their parts, making this one a fun, smart movie that is worth our while. The latest investigation shows off the talents of both the actors and their characters. Defense attorney Claire Darrow (Williams-Paisley) and district attorney Miles Strasburg (Cavanaugh) revisit a year-old case in which a woman was convicted of murdering her husband on their boat. All evidence points towards Laura (Jordana Largy) as the killer even though Tom’s body was never found. She publicly threatened to kill her husband, her prints and his blood were found on her clothes and the supposed murder weapon, and witnesses placed her at the scene of the crime. Claire and Miles aren’t inclined to take up the case, that is until a telling exchange about a cream cheese stain suggests to Claire that Laura might be innocent. As they learn more about Tom and his many deceptions and debts, they theorize that he might still be alive. Moreover, he probably faked his own death and framed his wife. As compelling as the case is, the real intrigue is in the characters’ personal lives. It’s a strong ensemble in which everyone plays his or her part and plays it well. Even the minor characters find a way to stand out, not least of whom is Zoey (Gelsea Mae), one of the young lawyers at Claire’s awesomely diverse office. She makes a consequential move that comes out of nowhere, and one that has me falling a little in love. Newcomer Roy (Mitch Ainley) also impresses as an earnest police officer whose troubled conscience kick starts the second investigation. The three leads really make the show though, and Hallmark doesn’t have a better team in its lineup. I especially can’t get enough of Malick, who plays Claire’s mother, Joanna. She’s still smarting for her unceremonious exit from New York City’s legal world and is adjusting to her job at the firm, but damn is she a snob and doesn’t hide it. Malick makes me love Joanna flaws and all, however. She might sneer at the lack of epicurean sensibility in town, but she mentors the younger lawyers, if begrudgingly, and agrees to go on a date with her granddaughter’s little league coach. Joanna’s relationship with Coach Reed (Paul McGillion) is exciting because of Malick’s performance. She’s a slightly Machiavellian sophisticate who isn’t a natural match for the Marcus Aurelius-quoting retiree but finds his confidence enticing and a challenge. Williams-Paisley and Cavanaugh are stars apart or together. Claire shares some nice moments with her daughter and her mom, with whom she has little in common, and Miles gets a refreshing storyline as a prosecutor rethinking his role in the justice system. They’re also electric as a couple, and I could power my day on their chemistry. Claire’s reluctant to admit that they’re in a relationship, but they are and they’re better for it. Besides challenging each other professionally and solving murders on their down time, they just enjoy being around one another. Their exchanges are fun, respectful, and sometimes awkward, but it makes their partnership feel genuine. Cavanaugh in particular adds great flare to his character, like when he snatches the umbrella in an attempt to be chivalrous or warns her against guitar-playing prosecutors. Miles has a way of looking skeptically at Claire when she’s at work, but in that look is admiration and trust. Okay, I might also have a nerd crush on Miles and/or Cavanaugh, which is why I hope his commitment to The Flash won’t keep him from more Darrow & Darrow, the best thing Hallmark has to offer right now. Highlight for spoilers: Damn, it was Dani’s boyfriend, aka first defense attorney, from the Garage Sale Mysteries. Dude jumps ship, kills a guy, and then goes back to being the dorky AV technician? I won’t trust him again. We should have guessed though from his lackluster defense effort. Bonnie gives it all up when she’s on the stand. Tom did in fact plan on faking his own death and enlisted her to help. On the night of the murder, he drugged his wife, grabbed his beloved baseball bat, and met Bonnie at the marina. He gave her a wig, making it easy for the old man to mistake her for Laura. After setting the scene, she stormed off, returning to the Graham residence to plant the evidence, and waited for Guy to pick her up. When he didn’t show, she hailed an Uber. Meanwhile, Tom was supposed to speed away in a second boat, but he and Guy fought over money, and Guy whacked Tom with the baseball bat. Since it’s still covered in Tom’s blood, Guy needed to steal it back from Claire. Also, Coach was a heart surgeon. Posted in USA, Western TV reviews and tagged Hallmark Channel, mystery films, TV movie on October 24, 2018 by limmer13. I don’t know if Royal Caribbean is hurting for customers or just trying out a new marketing strategy, but they have been making a push for their Harmony of the Seas jumbo liner. Love at Sea is the second movie I’ve watched in as many months that features this glimmering monstrosity, and both proved a chore to sit through. 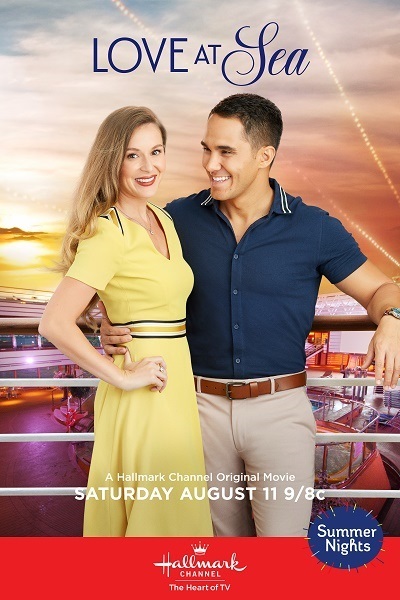 I was looking forward to seeing Alexa and Carlos PenaVega since a) I enjoyed their Christmas outing last year, and b-z) I demand more Hallmark movies featuring people of color, but this script isn’t helping anyone. The husband and wife team play a novice cruise director and event planner, respectively, and find themselves tested when they’re forced to work together. Olivia, daughter of a well known hotelier, is still smarting from a breakup when she agrees to help her friend, Ally (Melissa Carcache), with a job that takes both of them aboard the Harmony of the Seas. Ally, a popular YouTube personality who hosts her own lifestyle channel, will be filming from the ship alongside a Gordon Ramsey-like celebrity chef, and Olivia has to make sure the cruise tour is a success, not only so that her friend can land a network show but also so that she can establish her own event planning business. First time cruise director Tony might scuttle those plans though. While she’s the type who schedules things to the minute, he’s more of an adventurous, let’s go with the flow and see what the day brings kind of guy. It doesn’t seem like the right personality for a person who’s in charge of a 6000+ passenger cruise liner, but that’s just me. Although he wants to help Olivia he’s also overseeing a thousand other activities and has one shot to get things right if he’s going to secure a promotion. The ship looks grand and we get some nice sea views, but the first half of the movie is a mess. The script seems determined to set up an Elizabeth Bennett/Mr. Darcy kind of relationship between Olivia and Tony with the two going out of their way to create problems. Olivia doesn’t have sympathy for Tony’s job situation and the fact that he’s a last-minute fill-in for another director, and he feels no obligation to honor the company’s previous arrangements with her. On top of that, Olivia’s former romantic interest (Edward Finlay) is onboard to write an article for a travel magazine, and her mom (Audrey Landers), who looks like she hasn’t recovered from her pills, suddenly has a new boyfriend. There’s a lot of noise and tension, but it’s the kind that makes you want to change the channel and not figure out what’s happening next. And I did change the channel, until I decided to give the movie another chance. The second half improves, and I credit that to the turn towards a Fanny Price/Edmund Bertram relationship between the couple. The PenaVegas’ chemistry shines when Olivia and Tony start supporting each other. They show off more of their characters, including their vulnerabilities; her edges get smoothed down while he gets a better handle on his responsibilities. There are some clichéd scenes between the two – when they’re forced to cook together, when he serenades her during an evening show – but those give the movie a hint of the real-life romance that is the actors’ strength. Posted in USA, Western TV reviews and tagged Hallmark Channel, romance, TV movie on October 22, 2018 by limmer13. Half of the things that happen in Hallmark movies happen to me. I get stranded at airports and in small towns. I am from a small town. I confide in my mom. I confide in my mom because I don’t have a boyfriend – according to her and only her. I once had a job that left me with some money but no social life. I love Christmas. I eat sushi alone, at a restaurant, on a Friday night. Okay, that last one is because I live in Hong Kong where such scenes are totally normal. But on zero occasions did any of these scenarios lead to romance or even an encounter with someone I fancied. Once Upon a Prince is another reminder of how my life always starts out like a Hallmark movie but never makes it past the first scenes. Like Susanna Truitt (Megan Park), I also worked at a garden supply store and had my car break down on the highway, but unlike her, a handsome prince didn’t come help a sister out. No, it was just me, the semi-retired lady, and the sexually aggressive frat boy loading topsoil and price checking suet cakes and, when the car died, just me and the brother waiting for AAA. But it’s difficult to begrudge Susanna for her good luck and Prince Nate (Jonathan Keltz) for his because the two of them are so damn sweet. I feel bad for poking too hard at this fantasy even though I could easily harp on the movie’s formulaic plot, its bland storytelling, and its lack of compelling characters. In fact, Once Upon a Prince may be one of the least outstanding entries in the American girl marries British-adjacent royal genre. Others are memorable for their leading (and actually British) stars or for their wacky narratives, but this movie bets on two likable leads and their sappy, subdued romance. Susanna is a landscape artist from Georgia who undersells herself and Nate is the soon-to-be-crowned-king of Cambria who wants to be treated like a normal dude, and both are really nice people who deserve good things and each other. Both are portrayed by actors with a calming onscreen presence, and I am here for a mild love stories every now and again. I’ll gladly take another Hallmark movie in which Park and Keltz play polite lovers if that means there’s one less Lacey Chabert movie out in the world (sorry, LC fans). That’s because Susanna and Nate aren’t the usual glamorous, slightly out of place duo one finds in these films. Instead, they have a fresh appeal that is genuine and without ego. They don’t make many enemies, which leaves the movie without much of an antagonist. Nate’s mom, The Queen (Sara Botsford), opposes the match, but her son’s going to be king so it doesn’t really matter what she thinks. On-again, off-again Cambrian girlfriend, Lady Ginny (Marlie Collins), surprisingly keeps her distance too, even though she’s primed to stir things up. That leaves the other supporting characters, dulled by their steadfast love and support for the couple. Susanna’s family have all but adopted Nathan as their new in-law, and though the prince’s body man (Charles Jarman) is a bit more wary, he remains firmly in his charge’s corner. Duty is all that’s left to get in the way, and even that offers little in terms of narrative tension. Who needs story though when you have two nice people in love? And a prince.